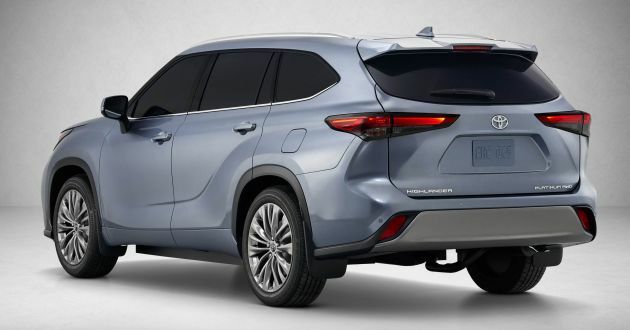 Toyota has unveiled the fourth-generation Highlander at the 2019 New York International Auto Show, which has been redesigned to take on other three-row SUVs in its segment. The new Highlander is built upon the Toyota New Global Architecture (TNGA), which is also used in other models like the Corolla, RAV4, Camry and Avalon. Toyota also notes that the SUV is now 60 mm longer than before, with all of it dedicated to improving cargo volume in the rear. A lot less aggressive in terms of styling, the latest Highlander now sports a smaller trapezoidal grille in place of the “Gillette Mach 5-like” setup on its predecessor. The standard LED headlamps are also more angular this time around, and they are now isolated from the grille. Elsewhere, the fog lamps have shrunken in size, while a wide lower intake completes the lower apron. Viewed from the side, the general profile may resemble that of the third-generation model, but there are a few differentiating cues. For instance, the blacked-out A-pillars provide a reverse “floating roof” look, while along the door panels, the prominent crease lines that gradually rise above the rear wheels have been made more fluid in their flow. The rear does have a Lexus vibe about it, and features slim, wraparound, two-piece taillights. Sculpted corners and a large trim piece in the lower apron are the only other highlights on show. This dedication to refining the Highlander’s styling extends into the cabin, which is more evolutionary than revolutionary in terms of changes, with slimmer air vents and a tidier grouping of the items on the centre stack. A standout here is the touchscreen infotainment system on the dash, which is available in eight- or 12.3-inch sizes depending on the trim level – the latter is said to be the largest in its segment. 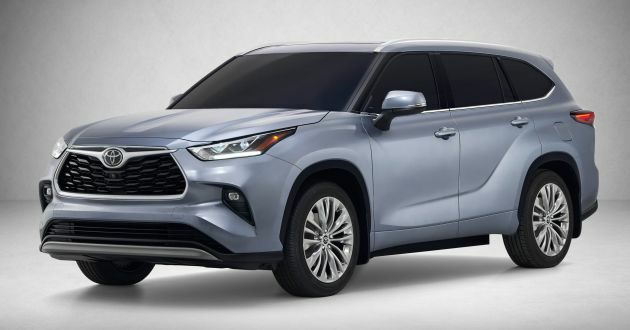 Available equipment for the Highlander include electric powered seats, a panoramic sunroof, power tailgate, a seven-inch multi-info instrument cluster display, JBL audio system, perforated leather upholstery, head-up display, as well as heated and ventilated seats, among others. Toyota Safety Sense 2.0 (TSS 2.0) replaces the outgoing model’s Toyota Safety Sense P, retaining features such as Pre-Collision System with Pedestrian Detection (PCS w/PD), Full-Speed Range Dynamic Radar Cruise Control (DRCC), Lane Departure Alert with Steering Assist (LDA w/SA), Automatic High Beam (AHB), while gaining Lane Tracing Assist (LTA) and Road Sign Assist (RSA). Customers will also get to choose between a seven- or eight-seat layout, with the former resulting in two captain’s chairs being fitted in the second row instead of a bench. On a related note, the second row can now be slid an extra 30 mm than before. As mentioned earlier, the added length does help improve the cargo area somewhat, with 456 litres (16.1 cubic feet) available when all three rows are in use – the previous model offered 391 litres (13.8 cubic feet). 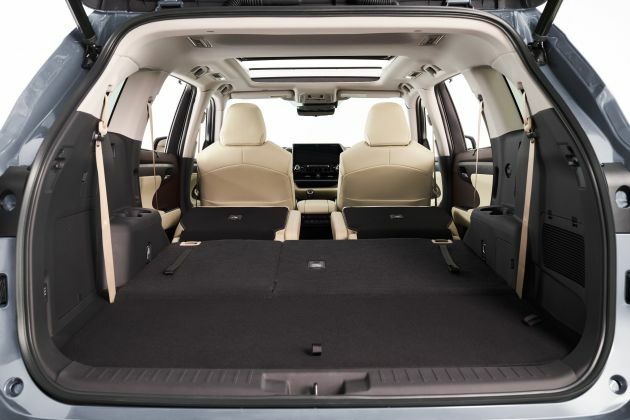 With the 60:40 split-folding third row tucked away, the available cargo space expands to 1,150 litres (40.6 cubic feet) – previously 1,198 litres (42.3 cubic feet). Lastly, with both the second- and third-row seats folded away, you get 2,076 litres (73.7 cubic feet), which is actually less than the outgoing model’s 2,370 litres (83.7 cubic feet). Only two powertrains are available here, with the first being a 3.5 litre V6 with 295 hp and 356 Nm of torque mated to an eight-speed automatic. The other options is the Highlander Hybrid that swaps out its 3.5 litre V6 for a 2.5 litre four-cylinder instead with two electric motors. There’s less output here (240 hp instead of 306 hp as before), but the gains come in terms of fuel economy – now 14.4 km/l (34 mpg) instead of 12 km/l (28 mpg) previously. On the mention of all-wheel drive, there are three different systems available for the Highlander – two for the standard V6 and one for the hybrid. In the case of V6-powered Highlanders, lower-end variants operate predominantly in front-wheel drive until slippage is detected; in which case, power is directed to the rear axle. A more advanced system – Dynamic Torque Vectoring AWD – for higher-end models is a predictive system whereby the AWD Integrated Management (AIM) manages electric power steering (EPS), throttle control, transmission shift control and drive torque distribution to continually optimise handling. The system can even disengage drive to the rear wheels to help conserve fuel where possible. As for the hybrid, it gains a rear electric motor that operates independently, so there’s no mechanical link between the transmission and the rear wheels. The motor helps by preemptively distributing more driving force to the rear wheels to suppress front wheel slip, as well as enhance cornering agility and providing rear-wheel torque when going over demanding terrain. So why does the front look like pre facelifted ASX with Proton Wings?